This evergreen shrub is covered in small, fragrant white flowers, which will persist into the New Year. A native of temperate South Africa, Buddleia auriculata enjoys a warm spot in the garden, and here thrives in this south facing corner beside Cory Lodge. The leaves are narrow and tapered, with a dark, glabrous surface. This species takes its name from the pair of ear-shaped auricles which clasp the base of the flower stalk. 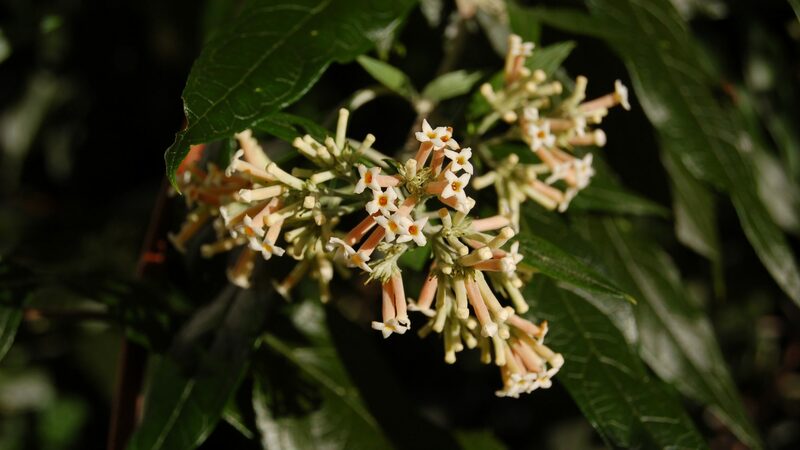 Numerous tubular flowers are held in terminal and axillary panicles, and are scented. The genus Buddleia is a member of the Scrophulariaceae, or figwort, family.